Nearly one year after its launch in Nov 2015, the rules of the game on the new six months visa or Multiple Entry Tourist Visa (METV) have changed, thus still confusing travellers. The METV is a flexible long term tourist visa that allows you to stay in Thailand for a maximum period of 60 days each time, during an entry period of 6 months. Essentially, it's a flexible tourist entry visa which already includes a multiple re-entry permit. With the METV, the Thai government aims to make Thailand more attractive to longer-term tourists. 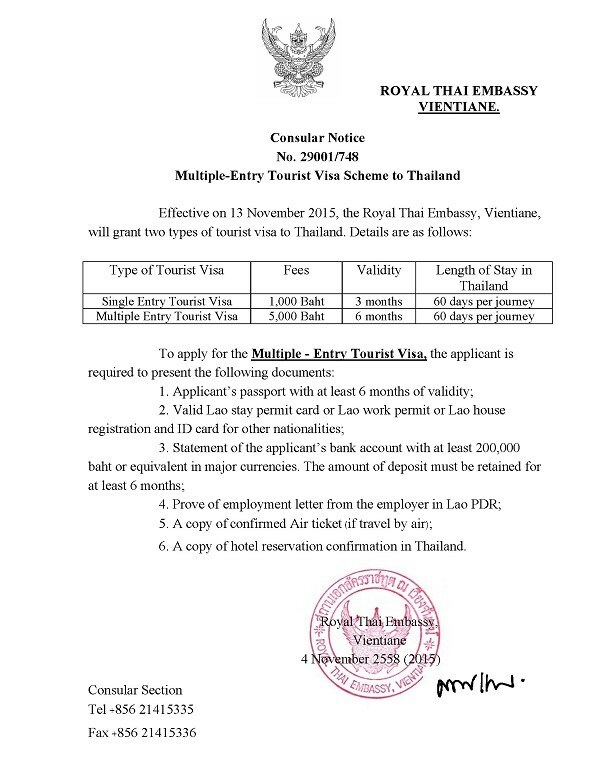 Single Entry Tourist Visa (SETV): valid for 3 months, each stay maximum 60 days. 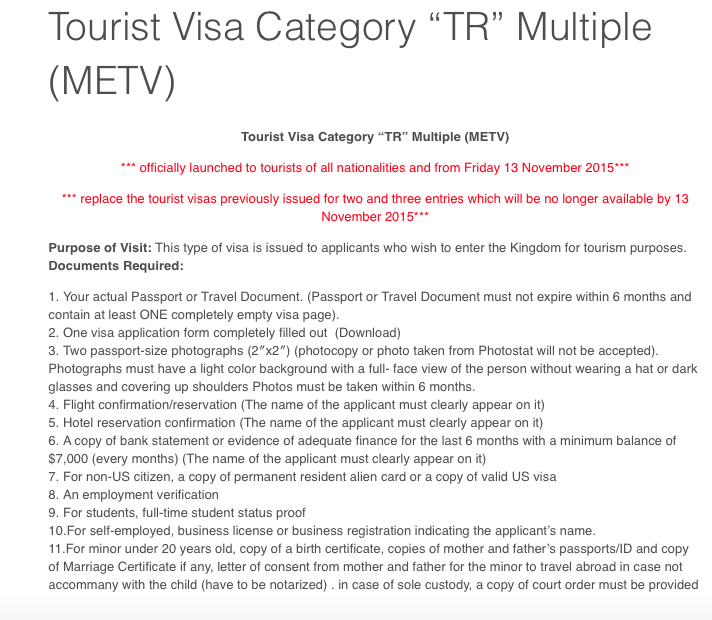 Multiple Entry Tourist Visa (METV): valid for 6 months, each stay maximum 60 days. The formerly popular double-entry and triple entry tourist visa were abolished with the introduction of the 6 months visa, and in a way you can say that the METV replaces them. The METV is designed as a flexible in-and-out visa, ideal for travellers to for example Southeast Asia who want to do several countries in a timespan of 6 months, with Thailand as their main (visiting) base. In essence, it’s an unlimited entry tourist visa, you can go in and out of Thailand as many times as you wish within a timespan of 6 months, and every time you enter Thailand you can stay for 60 days. The good thing of this visa is that you don't need to go to Immigration anymore to get a re-entry permit. 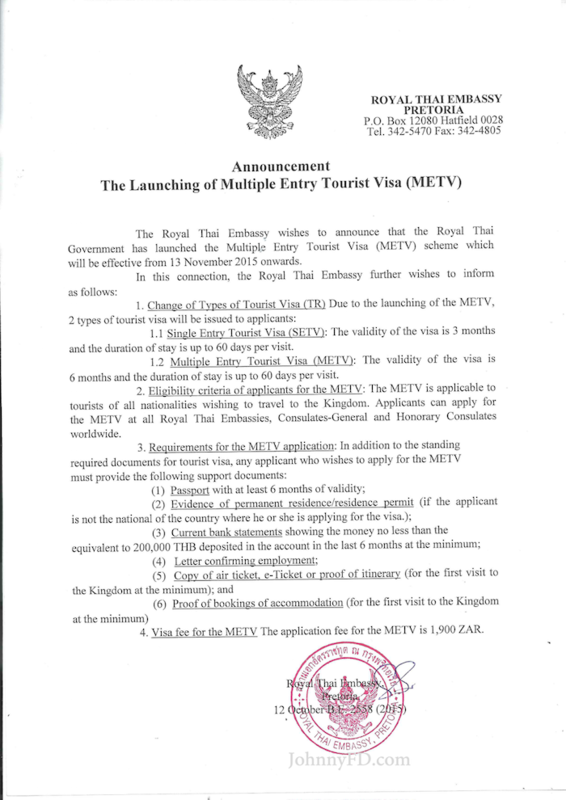 The main benefit of the METV therefore is flexibility to stay up to 2 months whenever you want, and you only have to go once to the Thai Embassy / Consulate in your country of residence to get that. a Single Entry Tourist Visa which will give you 60 days with the possibility of an extension of 30 days at the Immigration office. So, it makes sense to use the METV if you think that during the next 6 months you might be staying longer than 30 days (visa-on-arrival / visa-exemption) or longer than 2-3 months (SETV) for a few times. If your trips are planned and fixed, you can of course work with a combination of a few visas-on-arrival / visa-exemptions and/or SETVs which might be a bit cheaper in the end, but if you like the flexibility and want to save yourself the effort of having to go to an Embassy again, the METV is great of course. For long-stayers, the METV is much better than a combination of visa-exemptions / visa-on-arrivals because the Thai authorities generally don't like you to use that more than twice per year. If a Single Entry Tourist Visa costs you USD 30 and the Multiple Entry Tourist Visa USD 200, the METV will be much more expensive if you can plan your trips and just buy 2 SETVs. 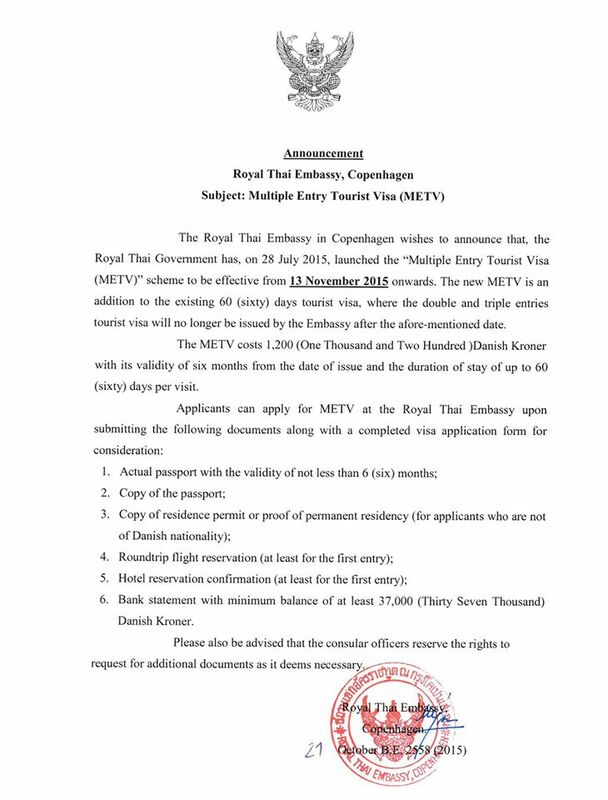 But don't forget, the METV automatically includes the multiple re-entry permit, which normally costs you about THB 4,000 so then all combined it's not that expensive. Again, only if you need the flexibility and comfort that the METV provides. 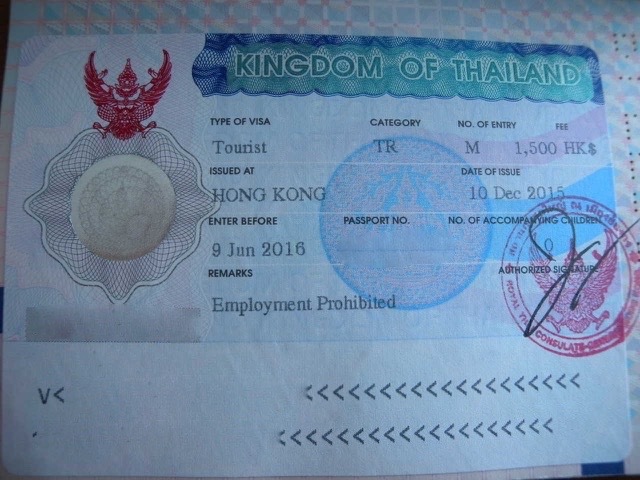 Is the new six months visa good for Digital Nomads and long-stayers in Thailand? That depends on how much of a nomad you are and how much money you're willing to spend on visa and necessary travel. Essentially, the METV allows you to stay for a maximum period of about 9 months (6 months + 60 days as a last entry + 30 days extension). If you want to stay in Thailand for a full year without leaving the country, you could also consider some kind of non-immigrant visa like the education visa, a volunteer visa etc. (although Immigration is always becoming more strict on that). If you fly out of the country every 60 days, you can use the METV to stay in Thailand for up to maximum 8 months. Some of the requirements of the METV can be troublesome for some digital nomads, such as: a letter of employment, proof of sufficient finance and the need to apply from your country of residence. So, compared to the old situation where you could stay on a double-entry or triple-entry tourist visa for about 6-9 months doing border runs only, the new METV is not really an improvement for the digital nomad who can't comply with all the new conditions. By the way, there is no visa in Thailand which is specifically designed for Digital Nomads or location-independent-workers, and it's highly unlikely there will ever be one. The introduction of the new METV (and the abolishment of the double- and triple-entry tourist visa) can work out well for the Digital Nomad who is truly travelling, because it provides comfort and flexibility at a reasonable price, but it's not an improvement for Digital Nomads or long-stayers in Thailand who stay too long are are more seen as Digital Settlers in the eyes of the Thai authorities. Nobody knows exact numbers or backgrounds of Digital Nomads in Thailand, but most likely the new METV doesn't get a warm welcome by most of them. Read more about why a Digital Nomad Visa is not likely to happen. 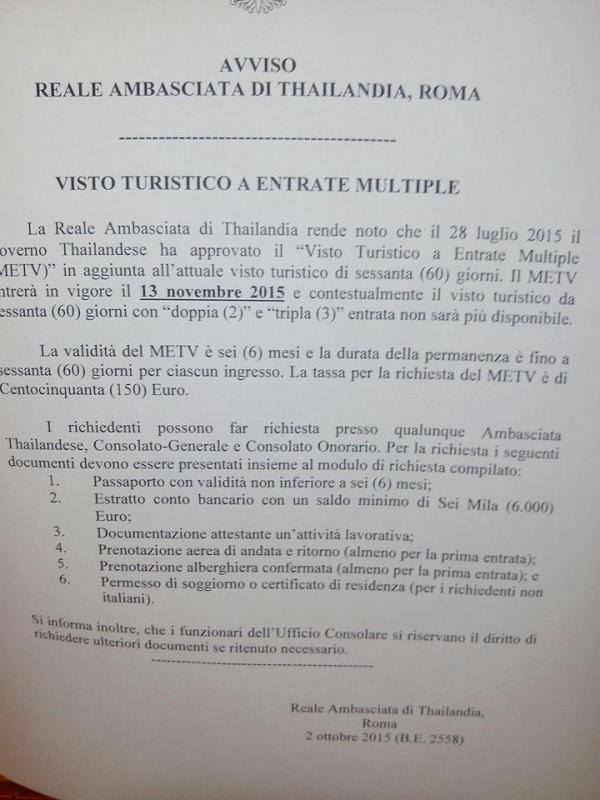 Immigration confirmed that the entries you get with the METV are normal tourist entries just like before. This means that you can renew an entry by just doing a land border crossing (in Maesai for example), you don't need to fly. Also, you can get a 30-day extension at the Immigration office at THB 1,900. All this means that the maximum period you could stay on one METV is about 9 months. The official entry period of the METV is 6 months. You could (re-)enter the country just before the 6 months have passed, then your next entry starts and this way you could stretch your maximum stay to about 8 months: 6 months + 60 days = about 8 months. After that, you could apply for an extension. - extend it at Immigration THB 1,900. Total costs: about THB 17,900 for a stay of 9 months so that's nearly THB 2,000 per month. The most expensive part is your necessary trip to Vientiane. The practise and implementation of visa rules can differ a lot between Thai Embassies and Consulates all over the world, so some Embassies might not ask for all these requirements but in theory they could. total costs on visa, extensions and travel were cheaper with the double and triple entry visa, if you stay in Thailand all the time. The Thai authorities aren't really good at dispersing clear and undisputable information about all details of visa matters, and so it is for the METV. 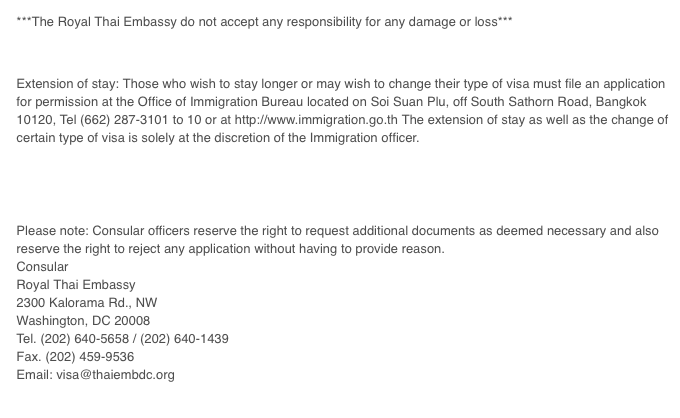 A good summary of the new requirements for the METV is by the Thai Embassy in Washington (more info here). As for further particulars with regards to the implementation of rules of the METV, we have to wait for experience from people. In July 2016, Immigration stopped people at the airport in Chiang Mai who had a METV and asked for the receipt proving payment at the Embassy or Consulate, as it appears that many Embassies / Consulates don't provide for the METV anymore. The computer system of Immigration isn't good enough to check the visa number so Immigration in Chiang Mai can't verify the authenticity of a visa issued in an Embassy. Most likely, not enough people have been able to apply for the METV given the rather strict and difficult conditions, so as we expected the METV might soon be history. Most Embassies provide this kind of letters, confirming the same. HELP. I want to stay in TH for four months what to do? The Volunteer visa by CM Buddy is a doubtful enterprise, the other visa he offers you can easily get by yourself. There are still schools that provide 1-year education visa. I wouldn't get my visa from CM Buddy, don't even think the guy has a work permit and if there is trouble with your visa provider you can get into trouble yourself and your visa will be revoked. Same happened for some schools that had doubtful practises, student from those schools got their visa cancelled and had to leave the country. Sounds interesting. What kind of 1-year special visa is that that you get from buddy? Thankfully I have one of those 1 year special visas from chiang mai buddy. Sure it cost more but it is year I can stay and not have to worry about immigration. Although how much longer the pay for stay visa options will exist is a worry. Its amazing how this is even a discussion for digital nomads.. 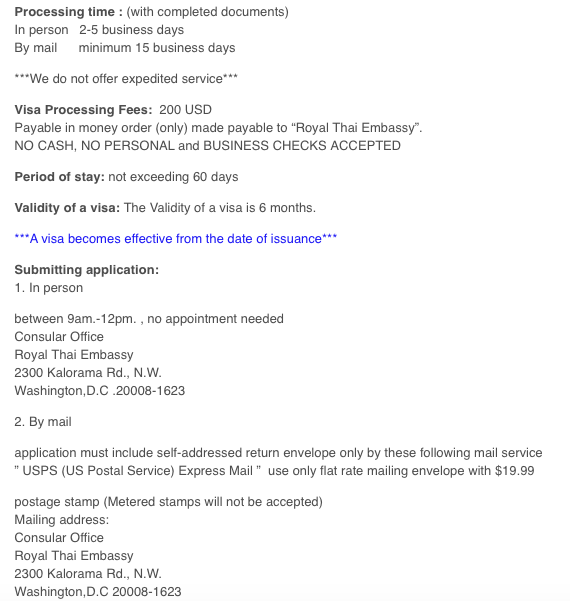 Tourist visas are a visa class that does not allow you to work in Thailand.. Working is doing anything for money, adsense, blogging, any activity even if its not yet making you money !! Stop screwing it up for the rest of us who stick to the rules. Tourists are not allowed to work in Thailand. If they want to, they need to have their visa changed into a Non-Immigrant B Visa. I just returned to Thailand from my home country so can't get a METV for this stretch. After reading this article and considering my options, would it not make just as much sense to get a visa on arrival, pay to extend that visa for another month, then exit the country and repeat as necessary? Thanks for the info. I'm planning to stay in Thailand for 6 months to do bicycle touring across the country. I don't have a job and only getting $400 USD/month from my apartment rent back home which i use for travel. I also have $8000 USD on my saving account. So the best for me is to apply for the double entry visa before 13th November i guess. Hi Andrew, thanks for your comment. We'll edit the text accordingly so that it's more clear to everyone. You're right, passport holders from many countries have a visa exemption for 30 days, often people call this a visa-on-arrival, but indeed it's nothing you have to apply for. The reference to the multiple re-entry permit being included in the METV is made in comparison to the old situation where you would need to buy a separate re-entry permit before you leave Thailand so as to not loose your entry on a 'normal' tourist visa. Hope that's clear and we'll edit it with all your comments so it's as clear as possible. I'm surprised that an article that's otherwise quite well researched still incorrectly calls a visa exemption a visa on arrival, and doesn't really mention about the advantages of this over the METV for anyone who's planning to keep re-entering the country. I also didn't really get the references to "multiple re-entry permit is included in the price". That's the point of this visa, not a freebie that Thai immigration is throwing in out of kindness.